Scenario- and story based courses are a powerful medium to immerse learners in situations where they can practice their skills. Writing engaging stories, with learner choices that encompass everything that you want the learner to experience is not an easy job. So how do you make sure your scenario situations are realistic, the choices are nottoo obvious AND make sure everything you wanted to be covered in the learning – the ‘learning objectives’ – is actually in there? For a recent course on smoking cessation conversations I was confronted with this issue, as the elements to be covered were very extensive. So how did I solve the design process? I went through a few steps that I feel I will use again for future designs. This is why I decided to write a ‘post-mortem’ (a common term in game design) of the process. In collaboration with the SME’s I created a spreadsheet- the ‘matrix’ – that listed everything that need to be taken into account, and that covered all the learning objectives in a detailed way. I guess it is pretty clear it became quite a big list! Just a sample below! In a first round, I tried to bring different elements from different lists together in the spreadsheet, change the colour when used etc, but it quickly became incomprehensible and hard to keep track of. So – binned that idea. Then I came up with the idea to make cards for every element, so I could combine from different piles (the age pile, the myths pile, the family situation pile,…). This allowed me to keep track of what I had already covered – after all, the card was gone! And not forget anything. While I divided the different cards in 5 piles (to make 5 scenarios), I was already working on each story in my head. I could see the people in my story come to life while I worked with the required elements and started to see which other elements fitted into their story. Using the decks of cards made that incredibly easy, as I could shuffle them around without losing track of all that needed to be included. I am convinced that writing strong scenarios also requires you to have a novelist’s or film writer’s techniques. There are plenty of books and site that help you develop these skills, and provide you with useful tips – some of these books are on my site. Based on my 5 card collections (5 scenarios! ), I wrote out the profiles of the women that would be the main characters of my scenarios. These profiles actually contained a lot of information about the full story as it would play out in the final interactive scenarios. 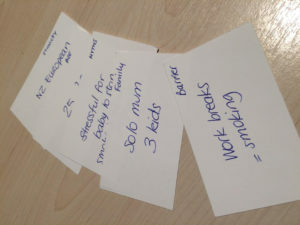 In a short style, I conjured a family situation, a real woman with a real life, but linking all the cards/pieces together that I would need to teach the learner about. Actually, the hardest bit here was to explain to the SME that this was not the ‘final profile’ that would be presented to the learner as a start of the scenario, and that this was not my final writing style either! These were working stories, that would provide the base to create all the dialogues and drip feed info. At the start of this project, it had been decided that we would work with video for the scenario parts that were the reactions and dialogues of the woman. The learner, playing a health practitioner, would get text-based choices, but be confronted with video reactions to those choices. 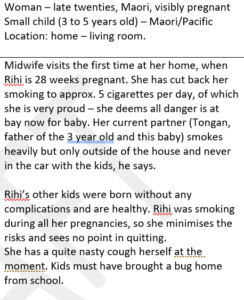 Their choice of questioning would also produce a lot of the information that was in the short stories as described in the previous step: they would talk about their family situation, their children, reveal their smoking cessation barriers, all in the interactive scenario. After all, this is how things happen in real life. To make the dynamic of the scenarios clear, and write the video scripts in context, I used Twine as a prototyping tool. I did this for two reasons: to make the SME understand how the final product would play out, and to have a way of teasing out the video scripts so we could start filming before all the final text-based content was reviewed and approved. I am leaving the full explanation of the how of this process – the authoring of the interactive stories in Twine – for a next blog post coming up next week.